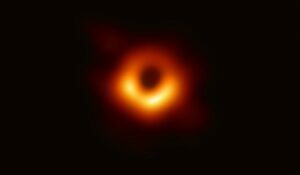 Astronomers have taken the first-ever image of a black hole, which is located in a distant galaxy known as ‘Messier 87’ (M87). The image which has been captured by a network of eight telescopes across the world shows an intensely bright ‘ring of fire’ surrounding a perfectly circular dark hole. The ‘Event Horizon Telescope’ captured the image from the galaxy that is 50 million lightyears away.